Awakening Mind—About us and our spiritual community: We have been brought together by a devotion to awakening that we feel in our hearts. The direct experience of inner peace and connection with the Spirit is our purpose. David Hoffmeister is the inspiration that has drawn the Awakening Mind community together. His radiant joy and boundless energy is the effect of letting go of the ego and identifying completely with Spirit. Enjoy these “taster” videos below! In this first video David shares beautiful teachings about an eternal state of mind, and the way to release the blocks to its awareness. David Hoffmeister is a mystic and a living demonstration that peace of mind is possible, because it is the Will of God. David’s gentle demeanor and articulate, non-compromising expression are a gift to all and an example of how to live in simple surrender to Spirit. David is world-renowned for his practical application of A Course in Miracles and his clarity about the function of forgiveness in spiritual Awakening as well as his radical use of mindful movie-watching in the release of judgment and fear is unique, individual, and unsurpassed. The purity of the message he shares points directly to the Source—God—and to a consistently peaceful state of mind. Since the early 1990s, students of non-duality and A Course in Miracles have felt drawn to David Hoffmeister for his profound love and devotion to truth. Over the many years since David began his traveling ministry, a community has organically grown around him consisting of those who wished to follow his example of pure devotion to God and selfless Love. This devoted community has come to be known as the Awakening Mind and Living Miracles communities, and is comprises a thriving global internet ministry with physical centers in Utah, Australia, Europe, and Mexico, including the first A Course in Miracles-based monastery in the world. Enjoy the many links and resources available to support you in your study of A Course in Miracles, your journey to spiritual Awakening, and the experience of lasting peace. David Hoffmeister and Awakening Mind welcome you to join our family of light! Awakening Mind is a foundation dedicated to Enlightenment. Forgiveness dissolves illusion and restores a state of mind that delights in experiencing the present moment! We welcome you to join our large global mailing list for inspirational messages and information about gatherings. David Hoffmeister radiates the experience that can be reached through single-minded devotion to forgiveness. “Seek and ye shall find” and “Ye shall know the truth and the truth shall set you free” are statements of destiny. All of the streams and rivers of consciousness must eventually arrive at the ocean of Self in God! David Hoffmeister and the Messengers of Peace live the experience of A Course in Miracles, having discovered it to be a clear, direct path to God. The time for words and concepts is almost over. Now we seek direct experience. We gladly lay aside techniques, repetitions, and rituals, so that we may come to experience the still reality within. We claim the peace, happiness, and Love that is our inheritance, and we come with empty hands and open arms to receive and give the blessed miracles given us to share. As we look around, we see that mighty companions have gathered beside us for this joyous ascent. A friend’s a friend forever in the Spirit of Love. The welcome never ends, for those who walk this way see their brothers and sisters as themselves. The holy relationship has at last come into awareness, blessing everyone and everything. The blanket of peace has spread across the face of the earth. Tranquility and grace are accepted! Prayer is the medium of staying in connection, in communion, and we pray unceasingly. If you wish to contact us we would love to hear from you! 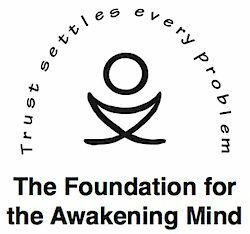 The Foundation for the Awakening Mind is supported through donations and Love offerings. When Enlightenment is deeply desired, the means are always provided. What is Awakening really? A Course in Miracles defines Awakening as the end of the dream of separation, conflict, fear, pain, and death, and the experience of the reality of the joy, peace and the Love of God. The meaning of Awakening therefore is experiential and not fully describable in words. Awakening occurs when the mind is willing and ready. The last step in Awakening is taken by God. Thus Awakening cannot be planned; it can only be a spontaneous occurrence. Just as our dreams cannot be relied upon to tell us of our waking state, we cannot understand what lies beyond spiritual Awakening from within the dream. What we can talk about is spiritual Awakening symptoms or signs. These are the miracles of forgiveness, which are the focus of the training of A Course in Miracles. This training is therefore not on how to awaken your psychic abilities but rather on seeing reflections of truth within the dream. These are the moments where you learn experientially that there is no separation between you and your brother. The ego will attempt to twist and turn these experiences into specialness, fragmenting love into specifics. Centering prayer on inner Awakening focuses on the practice of forgiveness so errors of differences and specialness can be replaced by the experience of oneness in the holy instant, for God has only one Son. The mind is awakening and this video shows witnesses around the world experiencing shifts in consciousness. Enjoy this music montage with Awakening Mind friends from the 1990s to the present.